HollyBeth Organics **with a discount! The main ingredients (which are all USDA organic) are sunflower oil, rich in vitamins A, D and E to help diminish fine lines; Pumpkin Seed oil, high in fatty acids, vitamin A and C which brightens and smooths the skin; Pomegranate seel oil, a powerhouse of anti-aging benefits that is packed with antioxidants; Palmarosa and Petitgrain essential oils which serve to fight wrinkles and add a subtle fragrance of tranquility. 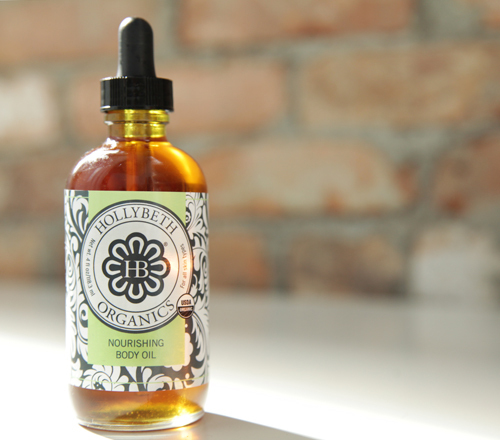 Like all of HollyBeth's products, this oil immediately feels good on your skin- quickly absorbing without feeling greasy. HollyBeth concocted this formula after a strong, intuitive inspiration. HollyBeth, "I've always wanted to do something with pomegranate and pumpkin because of their incredible elixir properties." I'm always happy when she is inspired- it's good for the rest of us. If you follow Sweet Peach, you know I am an avid fan of all that she does. Her thoughtful formulas come from a place of true care and passion and I do deeply appreciate that. As the only USDA certified organic skincare company in Georgia, HollyBeth Organics is a special find. Peruse all the goodness, here. And as if HollyBeth isn't amazing enough, she's offering 15% off any order - such a great deal and perfect timing for holiday shoppers. Thanks HollyBeth!